Fareham Neighbourhood Watch exists to support all the Neighbourhood Watch Schemes in the Borough of Fareham. We cover the areas from Portchester in the east to the River Hamble in the west including Park Gate, Sarisbury, Locks Heath, Warsash, and from the Solent as far north as the Borough boundary with Wickham. The Association is part of the Hampshire Neighbourhood Watch Association, covering the whole of Hampshire. The Association produces a regular Newsletter to all households in Neighbourhood Watch schemes within the Borough. This is generously supported by Fareham Borough Council. You are the eyes and ears in the community and there is a two way sharing of information to keep residents of Fareham safe. 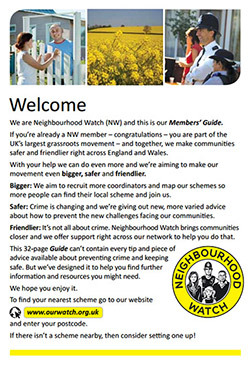 A very useful ‘Neighbourhood Watch Members Guide‘ is included on our website. Lives are at risk because emergency crews cannot see house numbers or names easily. Contact us to learn more about Fareham Neighbourhood Watch, to start a scheme, become a member or support us.